You’ve got to love a company that’s not afraid to innovate, and it looks like Carnival Cruises is about to turn the cruise industry upside down. The world’s largest cruise line just unveiled a celebrity-sighting cruise that spends a luxurious week at sea before ramming into George Clooney’s house. Now here’s a company that knows what people want! 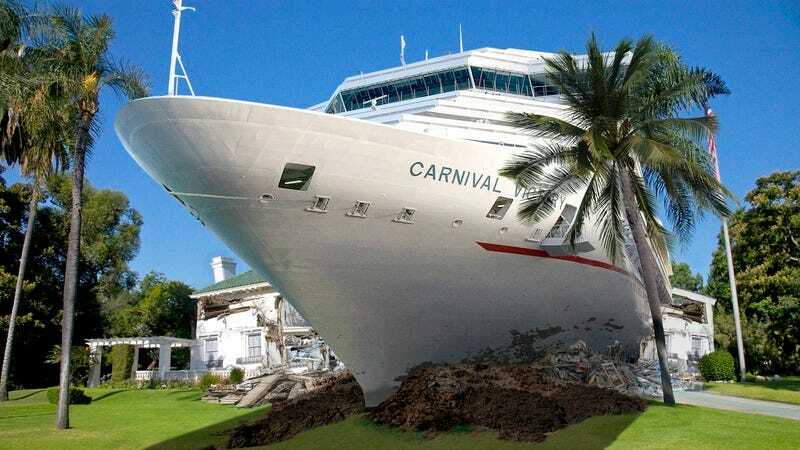 Carnival has really pulled out all the stops to make this latest cruise a truly once-in-a-lifetime experience. The all-inclusive vacation package includes an incredible seafood buffet, an onboard movie theater, and the 200,000-ton vessel getting up to speed so it can skitter over George Clooney’s private beach and careen into his lavish home for a totally exclusive look into the life of a star! With a day built into the schedule for passengers to disembark and explore the Clooneys’ decimated kitchen or smashed-to-hell wine cellar, this is an excursion that is a must for any George Clooney fan. While there’s no guarantee that passengers on the cruise will see George, Amal, or their twins when the ship goes barreling through their walls at 30 knots, the cruise does ram their house in the middle of the night to have the greatest odds of a Clooney sighting. Even if the passengers strike out and don’t catch a glimpse of a celebrity, they won’t walk away empty-handed, as they’re free to grab as much of the rubble of the Clooney estate as they want to take home as a souvenir. There aren’t many vacation options out there with a complete package like this. Like, try zero. There’s sure to be some imitators to follow, but you have to tip your hat to Carnival for being the first. It deserves every dollar it’s sure to rake in from this one. Innovation FTW!